Online registration and hotel selection for the 2017 NADA Convention and Expo in New Orleans is now open. The four-day convention, which runs from Jan. 26-29, will be held at the Ernest N. Morial Convention Center. Considered the auto industry event of the year, the NADA convention includes dealer franchise meetings, workshops, an exhibitor showcase and numerous networking events. NADA Convention speakers include comedian Jim Gaffigan and NADA chairman Jeff Carlson on Jan. 27; and inspirational speaker Amy Purdy and NADA vice chairman Mark Scarpelli on Jan. 29. A fifth speaker will be announced in the coming weeks. Kicking off the convention will be the NADA 100 Carnival, one of many events being held in honor of NADA’s 100th anniversary. The exclusive event for NADA members, international affiliates and guests will be held at Mardi Gras World from 7 to 10 p.m. on Jan. 26. The carnival will feature cuisine from top New Orleans restaurants, as well as entertainment from the headlining band Foreigner, Cowboy Mouth and local jazz musicians. The NADA member and manager registration fee includes admission to the NADA 100 Carnival. NADA members and their managers who register for the convention by Sept. 9 will receive a $100 discount from the onsite rate. The member dealer and manager registration fee includes admission to the NADA 100 Carnival, and convention badges must be presented at entry. A limited number of carnival tickets will be available for purchase by non-member dealers and managers; allied industry attendees are not eligible to purchase carnival tickets. Shuttle buses will be provided to and from Mardi Gras World and the official NADA hotels. Jim Gaffigan: Gaffigan, an entertainer and father of five children, has achieved major accomplishments in stand-up comedy, acting and writing, including two New York Times best-selling books, Dad Is Fat and Food: A Love Story. His semi-fictitious television show, “The Jim Gaffigan Show,” which TV Land picked up, is in its second season. Gaffigan has also guest starred on many television comedies, dramas and movies. With multiple projects in motion, Gaffigan is currently traveling the world with his stand-up tour, “Fully Dressed.” He is one of only 10 comics in history to sell out Madison Square Garden. Jeff Carlson: Carlson is president of Glenwood Springs Ford and Glenwood Springs Subaru in Glenwood Springs, Colo., and co-owner of Summit Ford in Silverthorne, Colo. As NADA’s 2016 chairman, Carlson is leading franchised new-car dealers through some of the most pressing legislative and regulatory challenges they have faced in years, including attacks on indirect auto financing and the dealer franchise system. Carlson started in the auto business in 1973, working for Ford Motor Co. In 1979, he joined Glenwood Springs Ford-Lincoln-Mercury as a sales manager. He purchased a stake in the dealership in 1982 and became president in 1986 and expanded the business to three dealerships. He represents Colorado’s new-car dealers on NADA’s board of directors. Carlson is a past TIME Dealer of the Year nominee representing Colorado. Amy Purdy: Through poignant and inspirational stories, Purdy informs audiences on how to use their challenges to push past their limits and live life without barriers. She lost her legs, kidneys and spleen to bacterial meningitis at age 19. Today, she is a top-ranked adaptive snowboarder, author of the New York Times best-seller On My Own Two Feet, actress, model and clothing designer. Purdy competed on ABC’s “Dancing with the Stars” and was the show’s first double-amputee contestant. Mark Scarpelli :Scarpelli is NADA's 2016 vice chairman, as well as president of Raymond Chevrolet and Kia in Antioch, Ill. His keynote address will highlight the association’s key priorities for 2017. Scarpelli, a second-generation dealer, worked his way up learning all areas of the dealership. In 1986, he was hired by General Motors as the district sales manager for the Boston zone, and three years later returned to the family-run dealership. He represents Metropolitan Chicago’s new-car dealers on NADA’s board of directors. It’s already a record-setting 2016 NIADA Convention and Expo, and the National Independent Automobile Dealers Association is just getting its week of meetings, training, networking and other festivities started. The 70th anniversary convention opened on Monday at its new venue — the recently renovated Mirage Hotel and Casino in Las Vegas — having already surpassed the record for most registered attendees, breaking the previous record by 19 percent. That previous record was set at the 2006 Convention and Expo at the Las Vegas Hilton. That record number is expected to grow with on-site registrations to solidify the event’s place as the largest in its 70-year history. NIADA highlighted that convention attendance had already been trending upward as last year marked the third consecutive increase, an 8 percent rise above the 2014 event. The 2016 convention attendance received an extra boost from the addition of the BHPH World Convention, one of the assets acquired by NIADA from Leedom and Associates in December. That convention has been folded into the NIADA Convention and Expo, significantly expanding its buy-here, pay-here and subprime auto finance training. As a result, the 2016 NIADA Convention and Expo offers more dealer education sessions on more topics than ever before, including an extensive BHPH component led by NIADA national director of 20 Groups Chuck Bonanno. Bonanno is a 13-year veteran of the Leedom operation who joined NIADA to grow the newly acquired educational assets, which also include 20 Groups, boot camps, dealership consulting and BHPH Dealer magazine. The association also mentioned this year's event also boasts the largest expo hall ever with more than 170 exhibitors in a space some 10,000 square feet larger than last year’s Expo at Caesars Palace. As always, the 2016 NIADA Convention and Expo features the insight of NIADA director of dealer development Joe Lescota and compliance sessions led by NIADA senior vice president of legal and government affairs Shaun Petersen, as well as industry knowledge and ideas from some of the industry’s best and brightest, including TrueCar chief executive officer Chip Perry, Autotrader’s Howard Polirer, Equifax’s Angelica Jeffreys, AutoZone's Ray Curry, NABD president Ken Shilson, Cox Automotive chief economist Tom Webb and more. In addition, the convention includes social events, networking opportunities and events to honor the used vehicle industry’s best — the National Leadership Awards Banquet on Wednesday night and the National Quality Dealer Award ceremony Thursday night. The month of June has kicked off with our team moving full-speed ahead with planning and prep for this year’s Used Car Week, which will be held Nov. 14-18 at the Red Rock Resort in Las Vegas. Each year at Used Car Week, the unique market conditions within the used-car industry drive the content, as do the various vendor participants, corporate and association partners, and others who will make Red Rock their home for the week. This year, I anticipate that one major topic will be the catalyst for discussion and debate both on and off the stage: supply surge. Even as you read this, there are thousands of used vehicles pouring through traditional auction lanes, digital marketplaces and disruptor remarketing channels into dealer inventory. Serious questions remain as to how this significant increase in inventory will be managed and how the industry can facilitate the sale — or lease — of these used vehicles to consumers. And serious questions have a way of eliciting serious answers. As the early agenda comes into focus, the faculty of speakers, panelists and presenters from all corners of the used-car industry is impressive. At the CPO Forum, America’s Used Car Conference, the data, analytics and information related to supply, pricing, wholesale acquisition and retail sales strategy will provide valuable insights for dealers, OEM and other executives, arming them with an advantage to close the year strong and open 2017 with a head start on their competition. The SubPrime Forum, in partnership with our colleagues at the National Auto Finance Association, will deliver an unmatched opportunity for auto finance executives across all spectrums to learn, network and return to their offices smarter and better prepared than ever before. I certainly expect the same with our Re3 Conference. Repossessions and recoveries are such an integral piece of the auto finance and remarketing puzzle, and this segment of Used Car Week has continued to grow in value and importance to the industry. This year marks the first for the combined meeting of the National Remarketing Conference and the National Auto Auction Association Convention. The planning for this combined event is moving along smoothly, and I credit my staff as well as the Frank Hackett-led NAAA team for making terrific progress in such a short amount of time. The industry estimates that by combining the NAAA events with Used Car Week, the cost savings in travel, time, lodging, food and more may climb into the millions of dollars. For so many of us who genuinely enjoy the time we spend with colleagues and appreciate the advantage in-person meetings and conversations have for our business relationships and profitability, this is an amazing opportunity. The NAAA-member auctions, the parent and sister companies, the associate members and more play an important role in the automotive industry, and these businesses continue to be the strength and foundation of the auto remarketing industry. Saving time, money and providing great value has been at the heart of the auction business since day one. And as the NRC and the NAAA join together, we stay true to that goal by helping the industry save money in expenses, travel time and more. Supply surge. No doubt about it, it’s here. Be sure you’re better prepared than your competitors to take advantage of the market opportunity for your company and your career. We want to partner with you to help make that happen. Make plans now to join the smartest people in the industry at Used Car Week in November. Feedback from recovery professionals who attended this year’s North American Repossessors Summit (NARS) highlighted how much the event was successful and demonstrated the ongoing improvement and evolution of the space. Organizers of the event hosted by American Recovery Association indicated that the summit ushered in a “new era” for the recovery and remarketing industry. From a record-breaking attendance of nearly 600 attendees, including recovery and remarketing professionals and finance companies, to a wildly successful auction contributing $9,600 to the Recovery Agents Benefit Fund, organizers believe NARS has proven to be a “must attend” event. “The new lender meetings were a tremendous benefit to both lenders and attendees,” said John Messiha, department manager repo operations at Capital One Auto Finance and one of Auto Remarketing’s inaugural group of Remarketing & Used-Car Industry’s 40 Under 40. “There’s no better place to connect with talented recovery and remarketing professionals who would be a great asset to our teams,” Messiha added. John Lewis elaborated about those points and more in a blog post published by masterQueue, which is powered by Intellaegis. Lewis is the president of Intellaegis and has served in moderator roles for the Re3 Conference at Used Car Week, as well. “There is a great deal of value and insight lenders can bring and gain,” and if (ARA consultant Les McCook) and his team continue to keep working on the agenda, educational topics, and networking opportunities between all forwarders, skip companies, repossessors (small and large) and all lenders who are pushing the work and managing these critical relationships, it’s a win for everyone,” Lewis wrote here. NARS 2017 dates will be announced soon, ARA said. The content at this year’s summit wasn’t just focused on skip-tracing and repossessing vehicles. The keynote address came from Vietnam veteran and four-time Super Bowl champ Rocky Bleier. That’s what Jeff Carlson, the 2016 chairman of the National Automobile Dealers Association, said NADA is trying to prevent through its policy work in Washington, D.C. The Colorado Ford and Subaru dealer said many of the federal government’s regulatory and policy moves related to the car business have good intentions, but could end up hurting consumers. This plank of NADA’s platform was part of a wide-ranging emailed Q&A between Carlson and Auto Remarketing three weeks prior to the dealer association’s annual convention. “NADA’s policy engagement efforts all have a common theme — and that’s protecting consumers from the unintended consequences coming out of Washington, D.C., and informing other key stakeholders about the tried-and-true benefits of the dealer franchise system,” Carlson said when asked about NADA’s goals and focus for 2016. “A major focus of NADA continues to be encouraging dealers to adopt the NADA/NAMAD/AIADA Fair Credit Compliance Program as the best way to address the issue of fair credit risk in auto financing,” he said. “This voluntary compliance program was structured to reflect a program by the U.S. Department of Justice that fully addresses fair credit risk in auto lending, while preserving the dealer discounts that are the hallmark of competition and consumer savings in the marketplace,” Carlson said. Policymaking and regulatory issues were also a key point when Carlson addressed the biggest hurdles for dealers. Auto Remarketing asked him what he sees as the biggest challenges for franchised dealers in 2016, and how these might be used as opportunities. “There are many federal regulatory issues today that could hurt our customers with higher costs. Whether it’s eliminating competition in the auto finance market or enacting an overly broad and counterproductive recall policy, there are a number of ideas emanating out of Washington, D.C. that, while well-intentioned, could result in negative unintended consequences,” Carlson said. “In these areas, NADA is working hard to protect consumer rights, consumer choice and consumer savings. Going back to one of Carlson’s policy points — that of vehicle recalls — it’s safe to say the auto industry has never seen anything like the current recall environment. Citing data from the National Highway Traffic Safety Administration, Carfax said in a recent analysis that more than 51 million recalls were issued in 2015, more than any year prior. The same bit of analysis from Carfax, released in February and reported on by Auto Remarketing, says there were over 47 million vehicles in the United States that had at least one unrepaired safety recall, at the time of the report. Numerous parties, be they government- or auto industry-based, have received criticism related to recalls, whether it’s their timeliness, execution or otherwise. Suffice to say, the actual process and logistics behind the reporting, fixing and adjusting to recalls has arguably had its challenges. Some, like AutoNation, have responded by not selling any vehicle under an open safety recall. We asked Carlson what NADA plans to do to help make the recall process smoother for dealers. “The nation’s franchised new-car dealers are the solution to completing safety recalls, and fully support achieving a 100-percent recall-completion rate. But we all have to remember that not every recall presents the same level of urgency to the driving public,” Carlson said. “In fact, the vast majority of recalls are for minor compliance issues that present virtually no imminent safety risk to the driver, passenger or other drivers,” he said. “So, why is it counterproductive from a safety standpoint to treat all recalls the same? Because studies show that prohibiting the sale of any used vehicle subject to any open recall, including the most minor of recalls, could drive down the value of trade-ins by literally thousands of dollars,” he said. “And if we devalue trade-ins, we automatically give consumers an economic incentive to turn to private market sales, where evidence clearly shows that the recall completion rates plummet. Plus, when a consumer’s trade-in is devaluated, it becomes more expensive for that consumer to purchase a newer, safer car. Beyond policy and regulatory issues, Carlson said NADA aims to continue giving dealers the training tools they need — through programs at NADA Academy, NADA University Online, NADA 20 Group and its annual convention — to adapt to changes in the car business. NADA is also aiming to bring younger generations of dealers and dealership managers into the “grassroots legislative advocacy” process with their respective dealer associations. 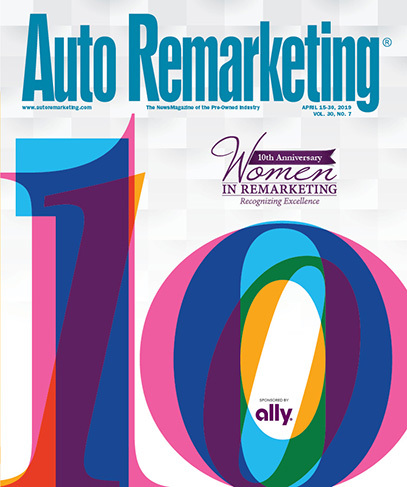 For additional coverage of the NADA Convention & Expo, see Auto Remarketing's Special Convention Issue. The U.S. Department of Transportation’s National Highway Traffic Safety Administration hosted a media conference call on Friday, outlining its current actions and future plans to prepare for the impending legislative needs of the United States in regards to future automated automobile technologies. NHTSA’s communications director Gordon Trowbridge fielded many questions from journalists and industry analysts, including quite a few trying to get a better idea of when we can expect automated technologies, such as self-driving vehicles, to actually become a widespread reality. In short, Trowbridge made it clear that NHTSA’s role in the situation is to make sure it is prepared when such technologies do become widespread, not to decide when it actually happens. The fact that the automotive and technology industries appear to be getting closer to making self-driving cars a reality in the next decade is evident, however, and NHTSA says it is taking several further actions to prepare. One such action is to hold two separate public meetings in April to allow interested parties to come and provide feedback to NHTSA with their concerns and suggestions to help the federal body develop guidelines for the safe development of automated safety technologies. The first will be held on April 8 in Washington, D.C.; the second will be held later in April at a yet-to-be-disclosed location in California, according to Trowbridge. He says that additional information for the California meeting, including the time, location and how the public can participate, will be released soon. Trowbridge also said that NHTSA has engaged in a number of conversations with state legislations to get a dialogue rolling to keep the lines of communications open between state and federal governments on the topic of automated vehicle technologies. In terms of who will decide whether a vehicle’s automated technologies are safe, whether it be state or federal authorities, is still undefined. In a release from NHTSA, Transportation Secretary Anthony Foxx commented on the organization’s goals in this situation. President Obama’s budget proposal for a 10-year, $3.9 billion investment in advancing autonomous vehicle technology, including large deployment pilots in communities around the country. Working with states to develop model state policy. Using NHTSA’s existing authority to interpret current regulations, and offer limited exemptions from those regulations, in pursuit of advances that could increase safety. Determining what new regulatory tools and authorities might be required to meet NHTSA’s safety mission in an era of rapidly changing technology. NHTSA also released its initial assessment of current Federal Motor Vehicle Safety Standards to identify the key challenges ahead between now and the full deployment of automated vehicles. The report, prepared by the USDOT’s Volpe National Transportation Systems Center, basically found that there are very few existing federal regulatory hurdles for the deployment of automated vehicles that feature traditional designs and equipment that accommodate a human driver, for example those containing traditional controls like a steering wheel, gas and brake pedals, etc. According to Trowbridge, the biggest challenge will be in the area for new automated vehicles designs that don’t feature such traditional designs. NHTSA Administrator Mark Rosekind commented on the findings of the report in a release from the administration earlier today. The full report from The Volpe Center can be accessed here. The 2016 NADA Convention & Expo in Las Vegas is just around the corner, and attendees would be smart to review what’s on the docket before they arrive for the huge event that has a full agenda. The NADA event is scheduled for March 31 through April 3 this year at the Las Vegas Convention Center — although some of the activities will take place off site, as indicated at www.nadaconvention.org. The event will kick off on Thursday, March 31 with registration starting at 9 a.m. On that first day, attendees will be privy to a presentation titled, “Connect with Car Buyers in a Mobile-First World,” as well as a series of concurrent workshops by NADA University Online. And keep an eye out for workshops from The Exchange, which features roundtable discussions built on peer-to-peer learning. Thursday will also feature a workshop titled, “Stacking the Deck with Four Aces in “Your Used-Car Department,” which would be particularly relevant to dealers trying to grow used sales. First thing Friday, the Expo Hall will open with a chance for attendees to check out the huge number on-site vendors, many of which are announcing new products at the event. There will also be a Dealer Franchise Meeting at 10:30 a.m. for Acura, Audi, FCA, Mazda and Nissan. The day’s schedule will end with the NADA Opening General Session, featuring Jeff Foxworthy, comedian and entertainer. On Saturday, attendees might want to check out the workshop, titled, “Attract and Retain Top Employee Talent,” presented by Kathleen Korpita of Cox Automotive. And franchise meetings for the following groups will be held that day, as well: 8:30 a.m. for Buick-GMC and Chevrolet, Ford, Honda, MINI, Subaru and Volkswagen, and at 10:15 a.m. for BMW, Cadillac, Kia, Lincoln, Mercedes-Benz, smart and Volvo. The day will close with a NADA General Session, featuring Howard Dean, Karl Rove and Mike Allen of Politico. There’s much more on tap for NADA, so for a full agenda and all the 411, check out www.nadaconvention.org. Meanwhile, next week is the NAAA/CAR Conference, which is also in Las Vegas. It includes a meeting of the International Automotive Remarketers Alliance, as well. The IARA-specific material at the event begins Tuesday with a day of IARA Certification testing, committee meetings and an IARA board of directors meeting to close the day. Action on the next day (March 16) will begin with a State of the IARA Address from IARA president Jeannie Chiaromonte and IARA executive director Tony Long. Concurrent roundtable discussions will follow, and then repeat. After the morning sessions is the IARA Circle of Excellence Luncheon. The afternoon IARA sessions kick off with NAAA and IARA presenting the Ed Bobit Industry Icon Award. There is also IARA certification testing from 8 a.m. to 10 a.m. on March 18. Organizers for this year’s North American Repossessors Summit (NARS), an industry event hosted by American Recovery Association and Harding Brooks Insurance, recently announced that all exhibitor spots for its eighth annual event are sold. The organizations indicated the high interest of exhibitors combined with record-high numbers of early bird registrants is setting up NARS 2016 to be the largest summit to date. Since 2008, NARS has brought industry professionals from around the country to collaborate and network with other like-minded individuals. NARS 2016 will take place April 14 and 15 in Irving, Texas. The sports-themed event will feature keynote speaker, Rocky Bleier, former member of the Pittsburgh Steelers, Super Bowl champion and Vietnam veteran. This year’s summit will have new attractions such as the DRN sponsored tailgate party, AT&T Stadium Tour and MVTRAC sponsored golf tournament held at the Cowboys Golf Club. Between these new events and the Harding Brooks Insurance sponsored cocktail party, attendees will have plenty of opportunities to mingle and network with possible clients, vendors and lenders. Interested companies can still contribute to NARS 2016 by making a monetary donation to the speaker fund. All contributions will warrant signage and recognition during speaking events. For more information, visit www.reposummit.com. The Northwood University/Cox Automotive Interactive Dealer Summit is coming up Thursday at the university’s campus in Midland, Mich. The event designed for networking and to spark important discussion surrounding marketing and retailing trends in the industry. It’s scheduled for from 8:30 a.m. (ET) to 5 p.m. on Thursday in the university’s Griswold Communication Center. The summit is focused on “information sharing, best practices and networking among the university's faculty and students, presenting Cox Automotive executives and attendees from leading Michigan dealerships,” a news release on the event said. Cox Auto VP of global talent management and diversity and inclusion Kathleen Korpita will talk on attracting and retaining top talent. And the Cox Auto executive panel will include Jared Rowe, president, Cox Automotive Media; Janet Barnard, president, Manheim North America; Rock Anderson, senior vice president and chief people officer, Cox Automotive; and Brian Geitner, president, Cox Automotive Financial Services and NextGear Capital. Also during the event, Northwood University president and chief executive officer Keith Pretty, senior VP Timothy Nash and Elgie Bright, who is chair of the automotive marketing and management degree program, will present a session on “The Northwood Idea” and introduce the university’s Dealer Workforce Study results. "The partnership between Northwood University and Cox Automotive represents a strong bond between two leaders in automotive marketing efforts," said Bright. "The Summit aims not only to educate and inform dealers about crucial industry trends and benchmarks, but it also provides dealers with the ability to meet Northwood University students in person. Our students are the industry's future workforce, and this event allows them to meet potential employers in person and make what we hope will be mutually beneficial connections,” Bright continued. The students will also play a role in the event. They will deliver the results of their practicum, Connected Car Study, and Cox Auto will honor its 2015-2016 scholarship recipients. The event will end with a networking reception hosted by Cox Auto University Relations. The event is designed as a three-way partnership between Northwood University, Cox Automotive, and dealers across Michigan. ServNet Auction Group’s president Kevin Brown recently introduced the association’s board of directors. Planning for a busy year ahead, the recently appointed Brown acknowledged the contributions of ServNet members past and present who are transitioning into new roles within the organization. Formerly the group’s president, Patty Stanley of both Carolina and Indiana Auto Auctions now serves as the chairman of the board. Ben Brasher, of Brasher’s Auctions, will serve as vice president, while Eric Autenrieth, of Indiana Auto Auction, is now the group’s treasurer. Steve DeLuca, the general manager of Auto Auction of New England, and Rob Brasher, of Brasher’s Salt Lake Auto Auction, replace Bill Williams (Flint Auto Auction) as ServNet’s directors. Rob Thompson, of Mid-State Auto Auction, maintains his position on the board as a director. DeLuca, named by Auto Remarketing as a member of 2015’s inaugural class of “Remarketing & Used-Car Industry’s 40 Under 40,” said, "It is an exciting opportunity to work in league with such a strong peer group on behalf of all the auctions in the ServNet group." Growing up in the business, Rob Brasher looks forward to serving on ServNet’s board. "As one of ServNet's founding members, Brasher's Salt Lake Auto Auction has enjoyed a long affiliation with the best independent auctions in the country," Brasher said. "As a member of the board of directors, I am looking forward to continuing the work started by my predecessors, ensuring that ServNet auctions offer an unmatched level of service to auto dealers, fleet and institutional accounts, and manufacturers across the country." In addition to acknowledging the new board members, Brown also tipped his hat to others who have contributed to the board, including R. Charles Nichols, of BSC America, Bel Air Auto Auction and Tallahassee Auto Auction, who has served as a director, vice president, president and chairman of the board. Nichols now serves as a ServNet representative on the AutoIMS/AASC Board of Directors, along with Greg Mahugh, of the McConkey Auction Group, who assists on the AASC Finance Committee. Doug Doll, of KCI Kansas City, will now serve as ServNet’s liaison to the IARA Board of Directors. Brown also pointed to ServNet’s CEO Pierre Pons, and his team at TPC Management, to thank them for their support of the organization. "Led by Pierre Pons, TPC Management has provided administrative support since 2008, and we look for that relationship to continue for a very long time," Brown said. "In facilitating leadership transitions as we move through two-year terms of office, TPC has enabled ServNet Auctions to flourish, commanding respect and prestige as a key voice and influence in the auction industry."